If you are looking for a narrow but extra long storage solution to park your bike, small boat or other investments, then maybe this Garage Shed is the one. The EasyShed Garage Sheds are considered small garages, perfect for those who need extra shelter but do not want to take up excess space. This garage shed spans 6 meters long and 3 meters wide leaving more than enough space for not only storage but a workshop too. You will enjoy the different options you get with EasyShed products because you can order a kit that suits your needs. This product is flat packed for delivery and everything you need to assemble it will be included in your kit. It is easy to assemble and instructions are provided. 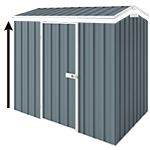 Garage Sheds also have a variety of accessories available for you to choose from. Please add them to your order now to help save you time and money. Shelves, windows and locks are just a few you can add to help get the best out of your product. NOTE: Please check and order Anchoring sets for your product to ensure you secure your shed at assembly. Thank you for a great experience from ordering the shed to final product. Helping with all information regarding my delivery more importantly for a Great Looking shed in my backyard now. Do your sheds abd garages cone in plain Zincalume? Hi Does this shed/ Garage comes with all the accessories i need it to mount it ( nuts bolts/ and all the fixing kit)? Can the door be installed any side and any location. Hello Nick, Yes, it comes with bolts/screws, shed ramp and anchor kit. The double door can only be position on the gable.